This garden showcases vegetables and ornamentals growing organically in raised beds, in-ground beds, and containers, with an emphasis on using recycled, recyclable or salvaged materials. 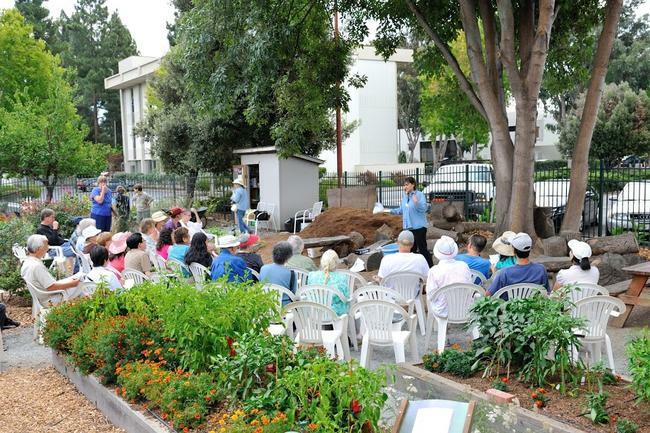 Visiting hours: Our free monthly gardening talks are generally on the 3rd Saturday of the month in the garden itself or in the nearby Sunnyvale Public Library. We work in the garden each Tuesday morning from 9 a.m.–12 noon in summer and 10 a.m.–12 noon in winter. Visitors are always welcome to our Tuesday gardening work days and our Saturday talks. The garden is also open during Open Hours for the community garden. Signage at each growing bed provides “what’s growing” and gardening technique information if we are not present to explain. Built in May 2006, our teaching and demonstration garden was created to be part of Sunnyvale’s Charles Street Community Gardens. Here we have a space to provide the gardening public with University of California Cooperative Extension’s research-based growing information through monthly gardening talks and the demonstration of seasonably appropriate edible and ornamental gardening techniques and best practices for soil management, irrigation, and pest control. Our garden consists of raised beds, in-ground beds, containers, and a table height accessible bed for growing annual edibles. We have 2 large beds planted in perennial California native plants selected to attract native pollinators to the garden and a shady bed of drought tolerant UC Davis Arboretum All-Stars ornamental perennials. Joining the community garden’s emphasis on sustainability in gardening, we repurposed many materials as we built the garden and we continually seek to conserve, reuse and recycle garden materials.